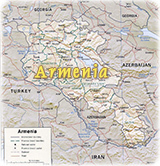 Armenia is a republic located in the south Caucasus, in western Asia. It occupies part of the isthmus between the Black and Caspian seas. Yerevan is the capital and largest city. In Armenian, the official state language, Armenia is named Hayastan. Ethnic Armenians, who call themselves Hay, constitute more than 90 % of the country’s population. Incorporated as a part of the Union of Soviet Socialist Republics, in 1922, Armenia became independent in 1991. Its first post-Soviet constitution was adopted in 1995. Armenia occupies about 29,800 km² of the northeastern portion of the Armenian Highland, an extensive upland area that extends as far south as Lake Van, in Turkey. Armenia is bordered by Georgia on the north, Azerbaijan on the east and the Azerbaijani exclave of Naxçivan on the southwest, Iran on the south, and Turkey on the west. The landscape of the country is extremely mountainous. The average elevation is about 1,800 m. Mount Aragats is the highest point in the republic, reaching a height of 4,090 m. Mountain ranges in the republic include the Pambak, Geghama, Vardenis, and Zangezur branches of the Malyy Kavkaz mountain system. The republic contains many mountain lakes, the largest of which is Lake Sevan, located in the northeast. Lake Sevan is the largest lake in the South Caucasus and one of the largest high-elevation lakes in the world. It is also a popular resort area. In the early 1990s the lake’s wildlife habitat was threatened, as large amounts of water were being taken from Lake Sevan to supply hydroelectric plants. A tunnel was constructed to bring water from the Arpa River into the lake in order to maintain a constant water level. Armenia contains a dense network of small rivers and streams that are part of the Aras-Kura river basin. Due to the mountainous terrain, waterfalls and rapids are common. 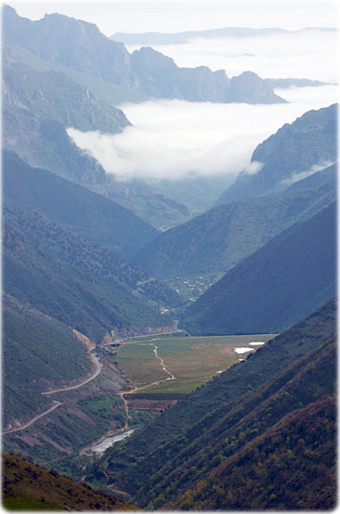 Meghri Pass, in Armenia (photo Alexey Averiyanov).